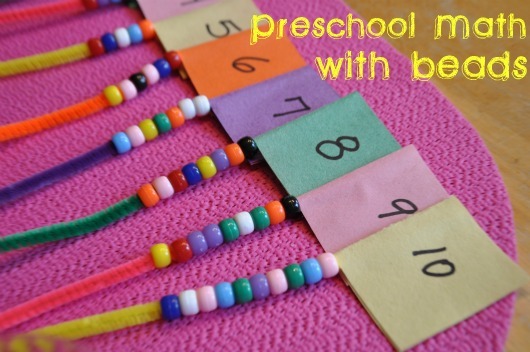 Preschoolers often learn how to count before they can actually identify the actual written number. My daughter is this way. She can easily count to 20 but struggles when I point to an 8 and ask her to tell me what number it is – we haven’t even begun working on recognizing written word numbers yet. So I’ve been looking for some fun ways to help her learn to associate her skills at counting with actual numbers. And what better way to do this than with an interactive game using beads and pipe cleaners? This project is super easy and inexpensive to make. You just need some pipe cleaners, construction paper, glue, a marker, and beads. I cut out strips of construction paper and wrote a number 1 through 10 on each one. I wrapped the construction paper around the pipe cleaner and attached it to the pipe cleaner with a glue stick. Then I gave my daughter a cup of beads. “Yay, beads!” she said. 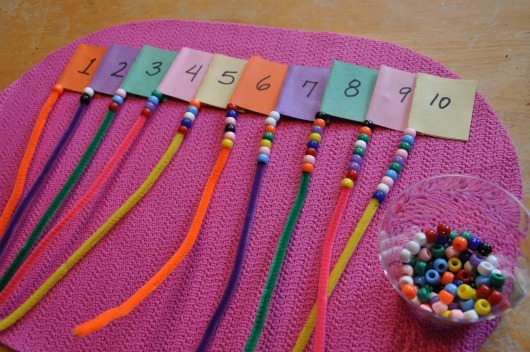 We did something similar where we learned patterns with fruit loops – beads were cleaner, and better for you! 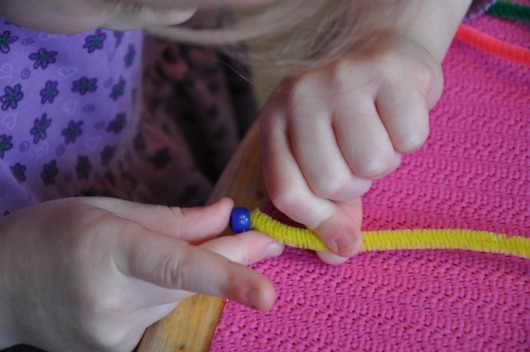 I told her to start with the number 1 and string one bead on that pipe cleaner. Then I asked her what number comes after 1? So I asked her to string 2 beads on the next pipe cleaner and I showed her the number 2 flag on that pipe cleaner. I talked her through it like this for the first few numbers. Then she caught on and started saying the next number and pointing to the flag all by herself! 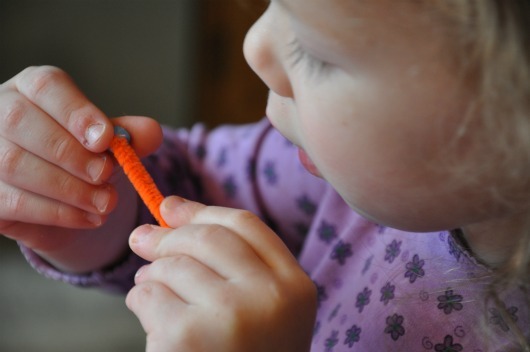 She had a lot of fun counting out the beads and threading them on the pipe cleaners. Before I gave her this project to work with, I had a fleeting thought about how particular she is about some things. I wondered if she might try to match the beads with the color of pipe cleaner and get upset if I didn’t have enough beads of a particular color for her. I decided that she surely wasn’t as compulsive as me to even think of something silly like that! I was right…and wrong. She is compulsive but in a totally opposite way than me. Instead of matching the bead color with the pipe cleaner color, she actively made sure that there were no beads that matched the color of the pipe cleaner they were on and actually put beads back if she grabbed one that matched! It was fun to watch her at work! My 3 year old had a great time doing math with pipe cleaners and beads. It definitely helped her see how counting related to the corresponding numbers. Looking for more Math Activities? Check out our post on Lego Math Activities. What a great activity. I love the small motor skills along with math skills that it covers. I have done this activity with both of my boys. They love it! What a great idea! 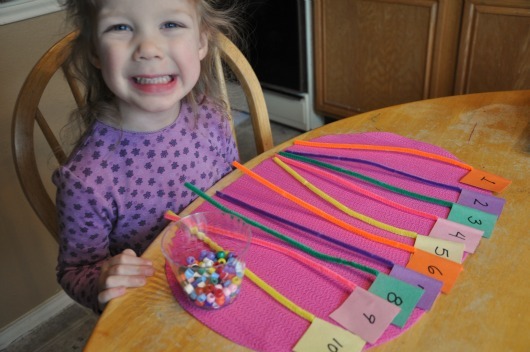 My little girl loves beads… Time to go to my bead supply and set up something like this! Thanks for a fun, inexpensive idea. A few minutes of set-up, supplies we already have and great correlation of number & object count. Awesome idea – I will do this with fruit loops for my tots! I love this!! I may have to link you to my blog when I try this with my 3 year old!! My 2 year old can recognized both the numbers and number words up to 25. She can count them out for me and everything! She cannot seem to count out beads in the appropriate quantities yet though. She seems to lack the focus to sit and string them (even when NOT counting), or even place them in bowls. I’ve tried several times & ways but she just counts to 25 as fast as she can while stringing on one or two beads, puts it down and runs off! I don’t want to PUSH her too much (she’s only TWO!) but any suggestions on getting her to focus? She’s turning into a multi-tasker and she still a TODDLER!!! Thanks for sharing this great idea to teach maths. Kids usually find it tiresome to learn in bookish way. This would be really fun for them to learn as well as enjoy the subject.